Touchscreens on Motorcycles: Are Riders More or Less Safe? Even the safest motorcycle riders are more vulnerable on the road than people in passenger vehicles. Riders must be vigilant in looking for any debris or potholes in the road which could cause them to lose control of their bikes, while also avoiding suddenly-stopped traffic, and attempting to dodge car and truck drivers who do not notice them. Is it possible that adding an on-bike distraction could be anything other than a recipe for distraction-caused accidents? Motorcycle manufacturers seem to think so. 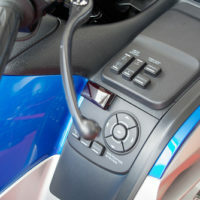 Touchscreen information systems have become increasingly common features on the newest models of motorcycle. BMW was the first manufacturer to introduce this feature, adding its Navigator V devices to certain models of bike in 2013. Then came the Harley-Davidson Boom! Box system, now available as a standard feature on fully half of all new bikes sold by the company. Last week, the manufacturer of Indian Motorcycles, Polaris Industries, announced that it would also be installing a touchscreen on-bike entertainment system on certain new models of its Chieftain and Roadmaster bikes. The Polaris system, known as Ride Command, will offer similar features to the in-vehicle entertainment systems that have become standard features in many passenger vehicles. The system will sync with the rider’s smartphone to allow the rider to make phone calls or access music on their device. It will offer direction mapping and will alert the rider to the location of the nearest gas station when fuel tank runs low. The system will also record technical information gathered while the owner is riding, such as the tilt angle during turns, acceleration, and braking style, offering the rider an opportunity to review this information and improve their technique. While a screen positioned in front of a motorcyclist seems like it could be dangerously distracting, manufacturers tout the significant safety gains over available alternatives, as well as technological advances that could keep riders safer. If bikers wished to access mapping software while riding, they have long been stuck trying to mount their smartphones on their bikes, or worse, using paper maps. A built-in system will be much more stable and less obtrusive. Harley-Davidson has installed controls for its Boom! Box system entirely in the handlebars, making it easy to control while riding safely. The BMW system offers information on the level of tire inflation on the bike, so that a rider can address a deflating tire before losing control of the bike, and all three systems would be able to notify a rider of precipitation falling on an upcoming portion of the route, or of stopped traffic, which can be especially dangerous for motorcycles. Overall, statistics show that motorcycle fatality rates have dropped as the use of touchscreen devices has become more widespread, so integrating such devices into bikes could increase rider safety to an even greater degree. If you or someone you love has been injured in a motorcycle accident in New Jersey, seek experienced and knowledgeable legal counsel to help you recover what you’re owed for your injuries by contacting the Wayne offices of Massood Law Group for a free consultation, at 973-696-1900.